TV technology moves so fast that it really can be hard to keep up. The big thing now is 4K Ultra HD, but what exactly is it? Simply put, it means a picture that’s more incredibly detailed than you’ll have ever seen before, as there are many more dots – or ‘pixels’ – used to make up the image. 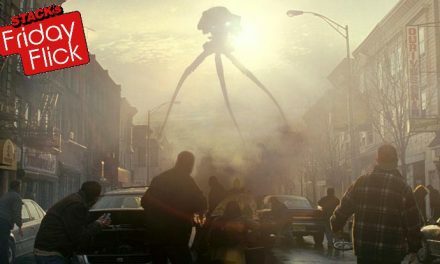 Whereas the jump from DVD to Blu-ray saw a picture that was around six times better, the jump from Blu-ray to 4K Ultra HD sees another four times improvement over Blu-ray. 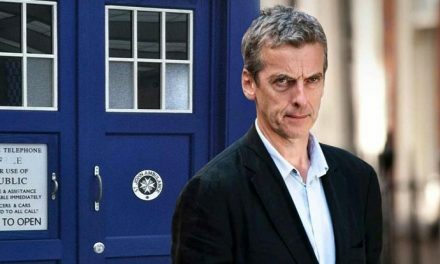 You’ll be able to see how hairy your favourite actors are like never before! The other huge leap with 4K Ultra HD is the addition of HDR – or ‘High Dynamic Range’ – to most new TVs. This means whiter whites and blacker blacks, offering much more lifelike images than we’ve been accustomed to. Some say that it’s an even more impressive leap than 4K Ultra HD vision itself, and when you combine the two, the effect can be truly jaw-dropping. Just look at the twinkles in those eyes and try not to be impressed! If you’re a movie lover, you want the ultimate in home entertainment quality available. Or if you just want to keep up with the latest tech, then 4K Ultra HD is a must-have. The best thing is that you can enter its world without dropping too much folding stuff – or you can go nuts and immerse yourself in the latest in sound technology to go with your super new TV and get your very own cinema-like experience happening. As a guide to your 4K Ultra HD options, we’ve put together this selection of basic, intermediate and advanced setups, all of which are available at JB Hi-Fi. If you’re on a budget but are busting to enter the world of 4K Ultra HD, you can get going with an affordable TV that supports the format, like this 43” Hisense model. It includes HDR support and is also capable of upscaling your DVDs and Blu-rays, meaning that while they won’t knock your socks off like true 4K Ultra HD content, they’ll still look better than they did on your old TV. 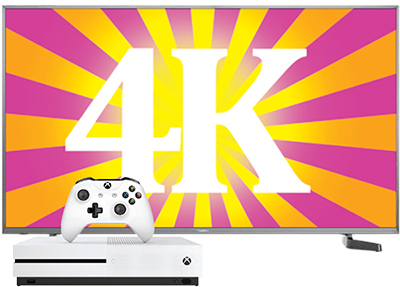 Microsoft’s Xbox One S console, meanwhile, makes for a great entry-level 4K Ultra HD disc player – and as a bonus you get a current generation games machine to play with. Score! If you’re thinking bigger – literally and figuratively – then you’ll want a nice big screen for your 4K Ultra HD experience, and better sound than just pumping it through TV speakers. The Sony X7000E is a perfect bigger screen, and more than enough if you’re relatively tight on room space. It includes HDR support and several bells and whistles including upscaling – plus it looks great. 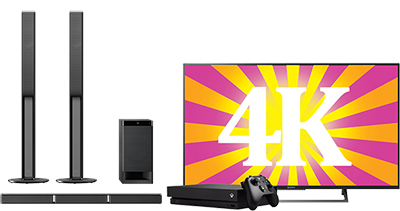 Billed by Microsoft as “the world’s most powerful console”, the Xbox One X is much more than just a games machine, providing a top notch 4K Ultra HD Blu-ray player and media hub, as well as delivering all the latest games in stunning 4K. Just clap your eyes on the likes of the Australia-set car game Forza Horizon 3 and try not to be impressed. Your new big screen needs some big sound, and that’s what you’ll get with the Sony HTRT40. It’s a 5.1 channel setup, meaning that you get left, centre and right audio from the main soundbar unit, rear left and right surround sound from the two tall boy speakers, and rumbling bass from the subwoofer. You don’t need to spend a fortune to approximate a cinema-like experience at home. If you DO want to spend up big, this is the sort of setup that you can consider. The 65” LG C7 OLED is impressive-looking enough when turned off, but turn it on and wow. Have you ever noticed how LCD screens tend to lend a milkiness to blacks? That’s because they have lights behind the screen to illuminate their picture. Using the latest in picture technology, OLED provides perfect blacks – and vivid colour – with every single pixel of the screen able to be lit individually. It also makes for an insanely thin television that’s perfect for wall mounting. Sony’s UBPX800 is a dedicated 4K Ultra HD Blu-ray player and media hub that will also play your current collection of DVDs and Blu-rays. It’s a solid unit, too – a REALLY solid unit. As for sound, the receiver and speaker combo above is just one example of the type of setup you can aim for if you’re looking for the best home cinema sensation that you can get. The 7.2 channel Pioneer VSX932 allows for various speaker setups, and is ready to rock with Dolby Atmos sound support. Here we’ve allowed for individual front left, centre and right speakers, two rear surrounds, a subwoofer that could really tell your neighbours who’s boss (tip: we’ve found it best to exercise some bass restraint), and two ceiling-mounted Atmos speakers. Setting it up may take some time, but the results will totally be worth it. Once you’ve set up your shiny new 4K Ultra HD rig, you’ll want some discs to truly show off its capabilities. These are just a handful of our favourite 4K demo discs here at STACK. While vision has taken a massive step forward with 4K Ultra HD, the audio boffins haven’t been caught napping. The latest cinema audio formats are Dolby Atmos and DTS:X, both of which use different methods to create 3D sound – so what you hear can be precisely placed and moved around in three-dimensional space. It’s rather like being in a cool bubble of sound. 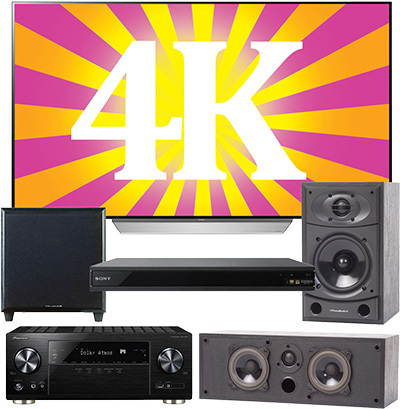 Most 4K Ultra HD Blu-rays feature either one of these audio formats, and with a suitable speaker setup in place, the results they achieve really helps elevate the home cinema experience to new, previously only dreamed about levels. 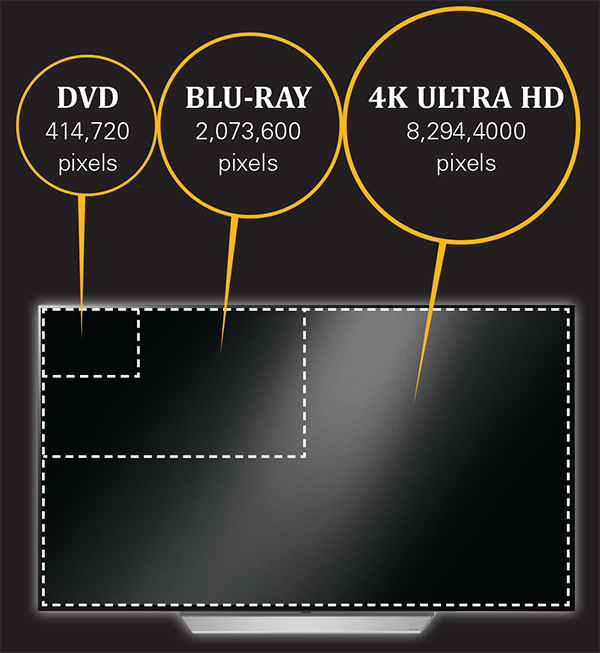 It’s easy to bandy numbers about, but even easier to show the differences in resolutions of DVD, Blu-ray and 4K Ultra HD visually. It would take approximately 24 pictures of DVD resolution to fill a 4K screen, or four of Blu-ray quality – the more dots, the better the quality that can be achieved when content is made specifically for the format. 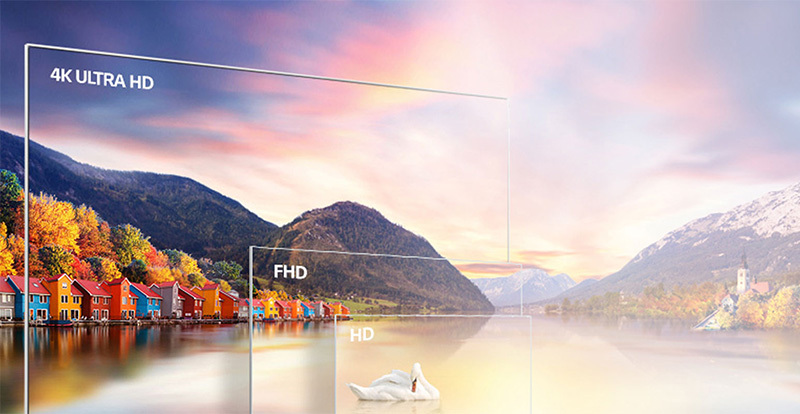 While most 4K Ultra HD TVs and players upscale DVD and Blu-ray pictures, the result uses calculated guesswork to resize the picture, so while it’s quite an improvement, detail is always lost compared to native 4K content.